The Coalfields Regeneration Trust (CRT) in Scotland won a resounding vote of confidence in the Scottish Parliament. MSP Christine Grahame won cross party support for a motion celebrating the success of the CRT and its work at the ‘heart and soul’ of coalfield communities. The MSPs praised the CRT’s Coalfields Community Futures Programme which enables local people to decide the priorities for a five year action plan, and have a say in how the budget is shared among community groups. There were also calls for the Scottish Government to continue funding the CRT’s work and increase their annual budget. Up to 2011 the CRT received £1.5m a year funding from the Scottish Government, and since then it has received £750,000 per annum - a reduction of 46 per cent. Labour’s Neil Findlay said: ‘‘We need the work of the CRT and others who work in partnership with it to continue. We need to keep funding those projects. 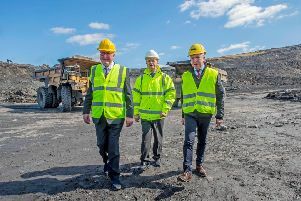 Carlo Biagi, the Scottish Government’s Local Government and Community Empowerment Minister said: “I add my thanks to the Coalfields Regeneration Trust for all its work in our former coalfield communities. The CRT’s chief executive Gary Ellis and head of operations (Scotland), Pauline Douglas led a 30 strong delegation of staff, and local organisations to the Parliament. Mr Ellis said: “I was really pleased for our team in Scotland that so many MSPs express their admiration and support for the work they do”. Pauline Douglas said: “Despite all we have achieved, coalfield communities still bear the scars of the pit closures 30 years down the road, and addressing the legacy of inequalities is what drives us on”.